I have always found mild amusement in the James Bond franchise, though even in its golden years I never considered the films anything more than genre escapism. Even when the series was reinvented, from the beginning this time, I was slightly under-whelmed. Although Casino Royale was a promising start, the film as a whole felt somewhat uneven and incomplete. The follow-up and only direct sequel to a Bond film, Quantum of Solace, was a big letdown despite the interesting and bold choice of director. Skyfall held no expectations for me, though I had more interest when I heard that Sam Mendes would be the director. Mendes has a limited filmography, proving to be somewhat picky in the projects he takes on, with Skyfall being the largest budget and only genre picture he has attempted. The match seemed strange albeit bold, especially since Mendes had been missing from the big screen since releasing two alternate views of married life with Away with Me and Revolutionary Road. Family drama had always seemed more suited to Mendes’ style, and perhaps this is why he was the best choice to direct the Bond film in which we learn the most about his childhood and family life. Skyfall is an easy film to compliment. Usually, even with some of the best films, there are only a few elements which elevate the film. Either a fantastic script, remarkable actor or strong visuals can make the film more memorable than the rest, but it is extremely rare for a film to excel in every way. 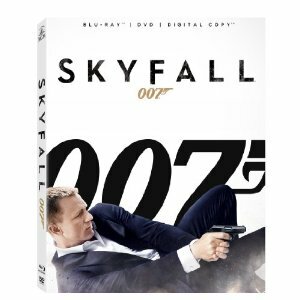 Despite easily being dismissible as a genre film, Skyfall was one of the best films of 2012, not to mention in the James Bond franchise. Every aspect of the film seems to come together into a remarkably entertaining and emotionally engaging film. Along with the direction by Mendes come the frequent partners in filmmaking, composer Thomas Newman and director of photography Roger Deakins. Both add a significant amount to the spectacle of the film, with Newman’s energetically percussion based interpretation of the classic Bond theme and Deakins’ incredible foray into digital photography. These are two great reasons to own this film on Blu-ray, especially for the soundtrack. The photography also looks great, though nothing compares to the way it looked in theaters. The Blu-ray release also has a DVD and a digital copy of the film. There are plenty of special features about the many iconic elements of a bond film, from villains and women to cars and gadgets. Even more impressive, however, is the incredibly informative commentary track with Mendes. There is a second track with producers Barbara Broccoli and Michael G. Wilson, and production designer Dennis Gassner. The Thieves has a complex plot with twist after twist, an extremely large ensemble cast, and a running time just over two hours and fifteen minutes. It plays somewhat like a more dramatic and complicated Ocean’s 11. So, I guess I’m saying it plays like Ocean’s 12. There are points in the film where the overblown cast and storylines go off-track a bit, and at times it is difficult to keep up with the many twists in the storyline. It is also often difficult to recover from the emotional whiplash, as the story jumps from comedy to melodrama and back again from scene to scene. All of this into consideration, The Thieves is still a remarkably worthwhile trip to take. It may not be a smooth ride, but it is a trip worth taking once the destination is reached. The ultimate destination in The Thieves is the same as Ocean’s 11, The Sting and every other great grifter film. What is more important than the protagonists getting away with their scam/theft is the fact that they do it in a way which proves they are more clever than their adversaries, and the audience. We must be fooled along with the mark, and The Thieves delivers this scenario several times throughout the film, leading up to the largest reveal at the climax of the film. The basic premise of this film is a group of con men and thieves teaming up for a major score, a 318-carat diamond worth 20 million dollars. They have two safecrackers to open two different safes, muscle for the strenuous parts of the job, and the ever-important disguise man. But underneath this traditional con film is a revenge movie, as two of the members of the crew have a past, which includes a love triangle with a female member of the crew. The Thieves currently holds the place for highest-grossing film in Korean box office history, which is easy to see with the scope of this film. There is a great deal to enjoy in this film, though it may be a bit bloated for the tastes of American audiences ignorant to the celebrity of the cast members. I believe most of what made the Soderbergh Ocean 11 franchise successful was the cast of incredible talent and stars, but this would not translate as well for someone who didn’t know Matt Damon from Brad Pitt.